Atlas and the Anchor: Stream It From The Mountain: Band Of Horses - "Acoustic At The Ryman"
Stream It From The Mountain: Band Of Horses - "Acoustic At The Ryman"
Band Of Horses return with the release of their first live album, Acoustic At The Ryman, out today via Brown Records/Kobalt Records. Just in time for Valentine’s Day, the intimate setting those two April nights in Nashville provided, proved to be the perfect complement to frontman Ben Bridwell’s signature soaring yet gentle voice and their close-knit vocal harmonies. The 10-song album includes fan favorites such as, “Marry Song”, “Detlef Schrempf”, and “Wicked Gil” and is highlighted by the stripped down anthem, “No One’s Gonna Love You” and a moving version of “The Funeral”. Using Mytek’s high-quality DSD recording devices, the album is also available on a perfect-sounding 180 Gram Vinyl and high quality 24-bit 96k WAV version, to put yourself in the auditorium with the band. 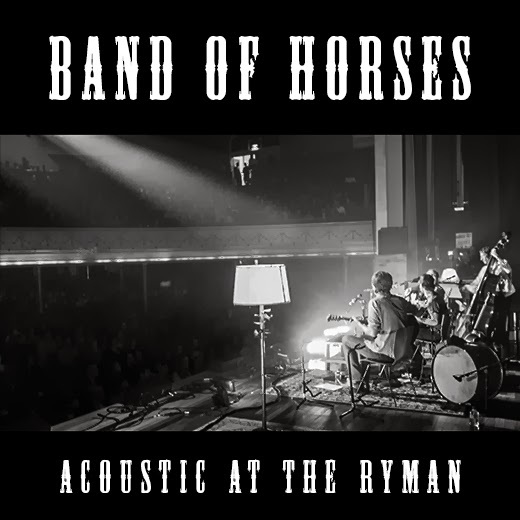 Additionally, the album’s release will coincide with a 13-date tour of acoustic performances that includes a stop at the legendary Ryman Auditorium.